A fresh face in the English department is in his second year at LPHS and has already proven that he is one awesome educator. Mr. Timmons teaches freshmen English. He’s in his third year all together, spending his first year at Warsaw High School. Timmons, a Valpo native, moved back up to La Porte when his relationship with his now wife was getting serious. A spot at LPHS opened up, and he’s been clad in orange in black ever since. Timmons graduated Valparaiso High School in 2011. After graduation, Timmons went off to college at Truman State University in Kirksville, Missouri. He had no idea which career route was for him, but he loved English, so he just kept taking English classes. After finishing his freshman year at Truman, he made a decision to transfer to Indiana University to finish out his schooling. Timmons took so many English classes that he was actually qualified for an English major, but he realized that there are not too many jobs out there available with that major. That’s when he made the choice to obtain a second major in Education, and he knew he’d love the chance to share his passion of language arts with students. 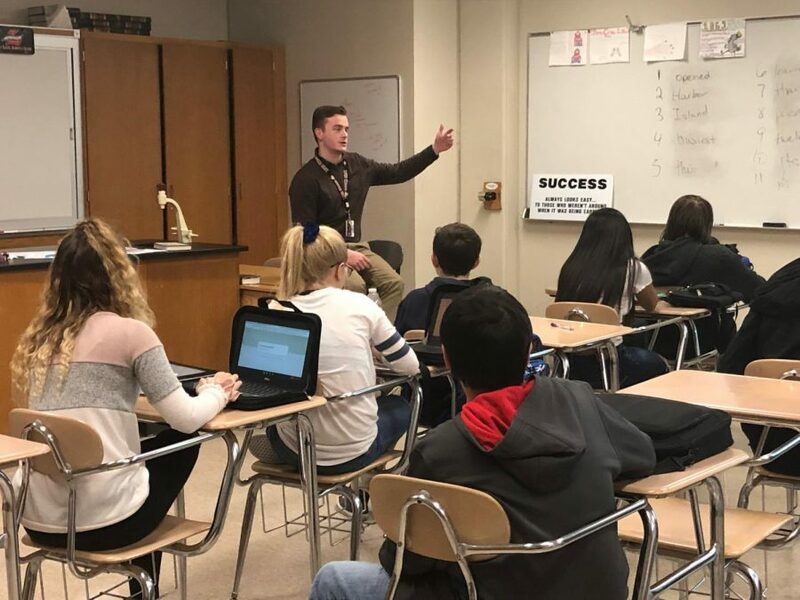 Timmons’ favorite parts of English have always been reading and writing, and he especially enjoys teaching it to high school students because it allows him to dive deeper into more advanced concepts than he would not be able to do with other levels. At the beginning of Timmons’ teaching career, the love for English is what gave him purpose, but now, it’s more than that to him. His job gives him the chance to impact the younger generation. “I really enjoy establishing positive relationships with my students and encouraging them to enjoy English class. I love seeing kids get into whatever it is we are reading or writing in class,” Timmons said. In school, people know Timmons as a trendy and kind guy, but outside of school, he has a whole different side to him. “I fish bass tournaments, deer and duck hunt, snowboard, and enjoy riding my motorcycle,” Timmons said. He loves teaching English but hopes that someday he will receive his Masters Degree and become an administrator. LPHS is incredibly lucky that Timmons became a Slicer. It’s a better place with him.